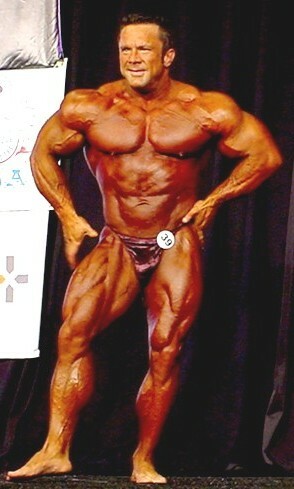 The 2004 NPC Masters Nationals Championships were held in Pittsburgh, Pennsylvania, on July 23-24, at the Sheraton-Station Square Hotel. Gary Udit promoted and MC'd the show. This competition took place in conjunction with several others -- including the Teen Nationals, Collegiate Nationals, Collegiate and Masters Women's Figure Nationals, and Teen Women's Fitness Nationals. The Masters Nationals prejudging took place on Friday, July 23; all other contest categories were prejudged on Saturday morning and afternoon. The evening show involved over 250 competitors. Udit deserves credit for pacing the event briskly and efficiently. It began on time at 6:00 p.m, ending before midnight. There were no breaks, no guest posers, and no lulls. The winner of the over-40 Masters Nationals received his IFBB pro card, qualifying him for the Masters Olympia. A welcome change this year was an additional pro card going to the winner of the over-50 Masters Nationals, again qualifying him for the Masters Olympia. Before the final posedown of the evening, Udit said that these men were "the best group of class winners we've ever had." He announced that the show would be held at the same venue about the same time next year. Winners, over-40 Bantamweight division. Torres, out of picture to right..
Masters Nationals over-40 lightweight class (up to 154 1/4 pounds). Lance Johnson, on hearing that his nearest competitor Danny Weigand took second place.